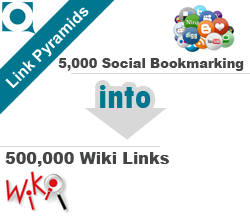 5,000 Social Bookmarking into 500,000 wiki links. Backlink pyramids involves the process of building special types of links in an ordered & systematic way, use sites as the base for you links and then building several layers of connected backlinks that point to each other which finally point to your website.Basically link Pyramid is the perfect long term method that deploys a wide variety of link building types as well as a strategic link building methodology. - TIER-2:Juice all extracted links into 500,000 Wiki Article Submission. Private proxies used for less footprints. Random user name for less footprints.